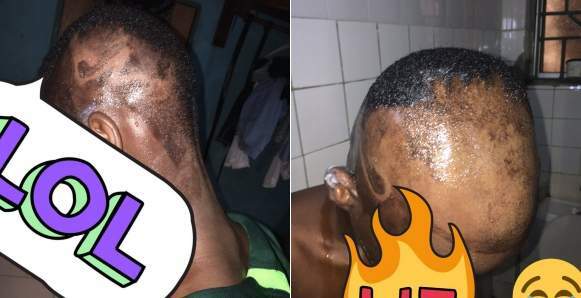 A mum shaved off her son's 'cultist hair' in Lagos, and according to Twitter user @barrister_nofi, the said act was done with a blade. The Twitter user further disclosed that her brother is just 15-years-old, and he had an 'adidas logo on one side and Nike on the other side, tinted one side gold and the other side black'. "Rubbish all these over sabi ,false deep pretenders If you tell me rubbish,I'll block you A 15 year old,already had a crazy hairstyle,with adidas logo on one side and Nike on the other side,tinted one side gold and the other side black and you're telling me not to turn his head".